Michael Yavonditte gets asked to make a lot of introductions between investors and entrepreneurs (especially since he sold Quigo to AOL for $340 million in 2007). Last July, he and his team quietly launched Hashable in private beta to make intros much easier. Hashable lets you introduce any two people via Twitter or email, and then follows up to see whether those intros were successful. Yavonditte explains how Hashable works in the video above. The service is still in private beta, but the first 2,000 people to follow @hashable on Twitter will get an invite into the service. You can also claim your profile after being introduced to someone else by an existing member. Hashable lets you make introductions in three simple ways, through Twitter, email, or its website. (iPhone and Android apps are in the works). On Twitter, all you need to do is include the Twitter handles of the two people you want to introduce as well as @hashable, and the hashtag “#intro.” For instance, if I wanted to introduce investor/entrepreneur Chris Dixon to VC Fred Wilson (assuming they didn’t already know each other), I would Tweet out something like “@cdixon meet @fredwilson, you guys would get along #intro cc @hashable.” Then Hashable would put out another Tweet to both of them with a short link to an icebreaker page on Hashable with some bio information from each one and a quick way to reply via Twitter. The icebreaker page also shows Twitter followers both people share in common. 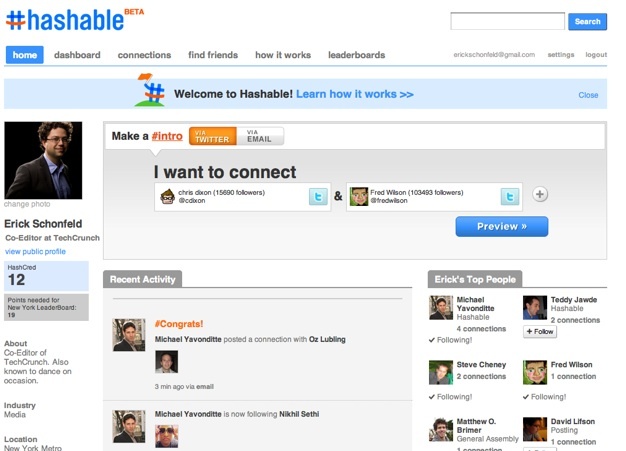 Hashable also works through email by simply sending an email to both people and Ccing post@hashable.com. (You can do private introductions through email by CCing dontpost@hashable.com). Each recipient will get an email with the other’s bio in the body of the email. Finally, there is an intro tool on Hashable.com which creates either Twitter or email intros automatically. The bio info is pulled from LinkedIn, Twitter, and Hashable profiles. A few days after each intro, Hashable follows up with each recipient to see if they connected. The more people you introduce successfully, the more HashCred you get. HashCred is a point system that awards you for taking various actions on through the service. And yes, of course there is a leaderboard. You can import your Twitter and email contacts into Hashable or follow people on there already to see an activity stream of who is connecting to each other. (Most intros are public, unless you specify otherwise). If you want to keep track of other types of interactions, you can do so by adding any hashtag to your hashable Tweets such as “#justmet” or “#lunch” or “#coffee.” It is an easy way to archive all of your introductions and meetings. Each hashtag is searchable and sortable on Hashable’s website. Hashable is definitely trying to encroach on LinkedIn’s territory here, since one of the main activities on LinkedIn is professional introductions. But as Yavonditte notes, “On LinkedIn you have to pay for introductions, or can only introduce people you are connected to.” With Hashable, you can introduce anyone in your contact list or anyone on Twitter, whether you personally know them or not. Whether or not Hashable will become overrun with recruiters and sales people like LinkedIn did will depend on what kind of introductions are encouraged. That gets back to the point system and what gets rewarded. Yavonditte is also mulling over ways to protect super-connectors by allowing them to charge points for making an introduction, or turning HashCred into a currency where you can thank someone publicly for an introduction that turns into a hire or an investment. There is certainly room for a better way to make professional introductions. At our last Disrupt, two of the finalists, Sumazi (TC writeup) and Namesake (TC writeup) launched with services attacking a similar problem. Yavonditte is also the CEO of Tracked, a very deep information resource about companies and people. Both Hashable and Tracked are part of parent company UpCompany. However, Hashable is in the process of getting spun off as a separate company.